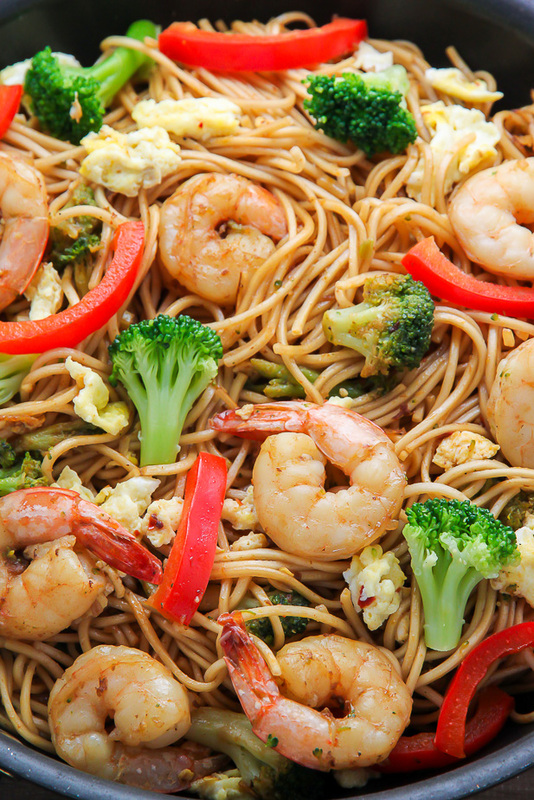 20-Minute Shrimp and Broccoli Lo Mein, because let’s be real, sometimes we just need a quick and tasty, noodle dish. 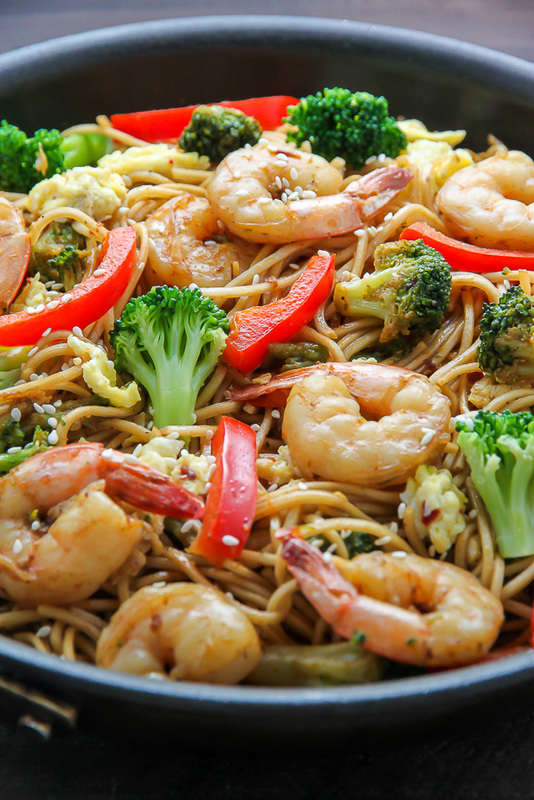 Loaded with juicy shrimp, crunchy broccoli, and so much flavor. The whole family will love it! Hi and happy Monday! 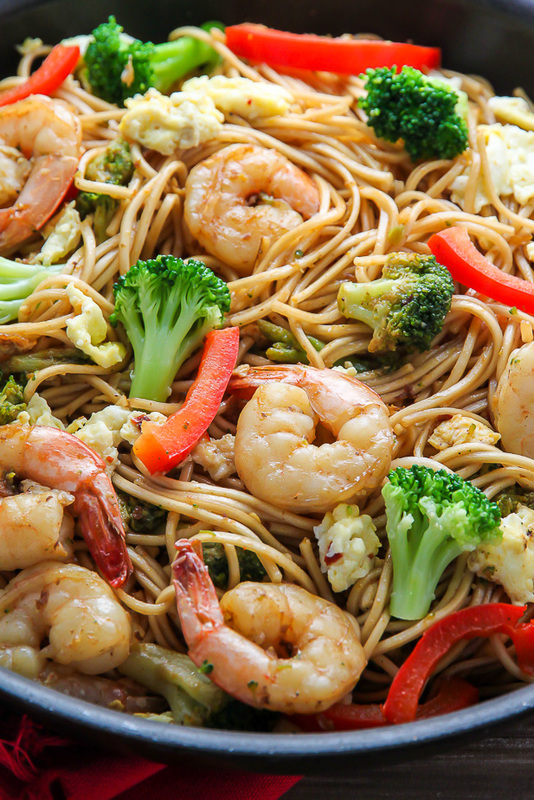 Today we’re keeping things short and sweet with this easy recipe for 20-Minute Shrimp and Broccoli Lo Mein. 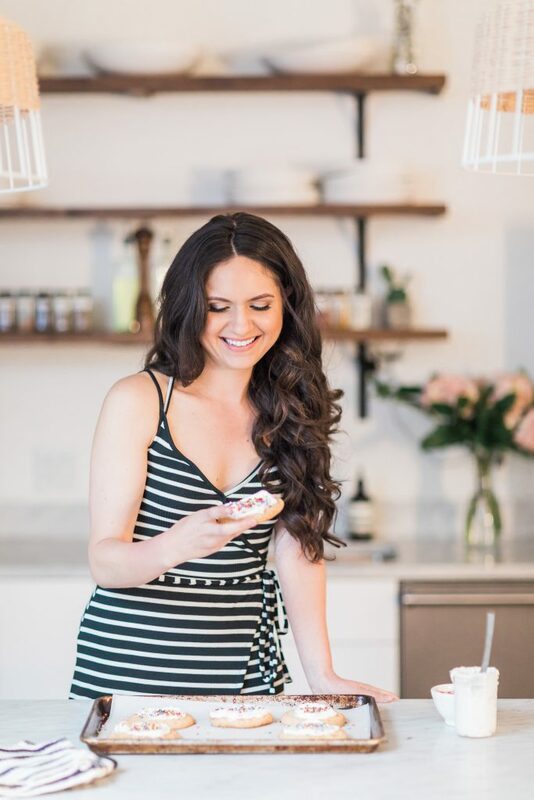 So if you were unsure just what to make for dinner tonight… read on, my friend; I’ve got you covered. 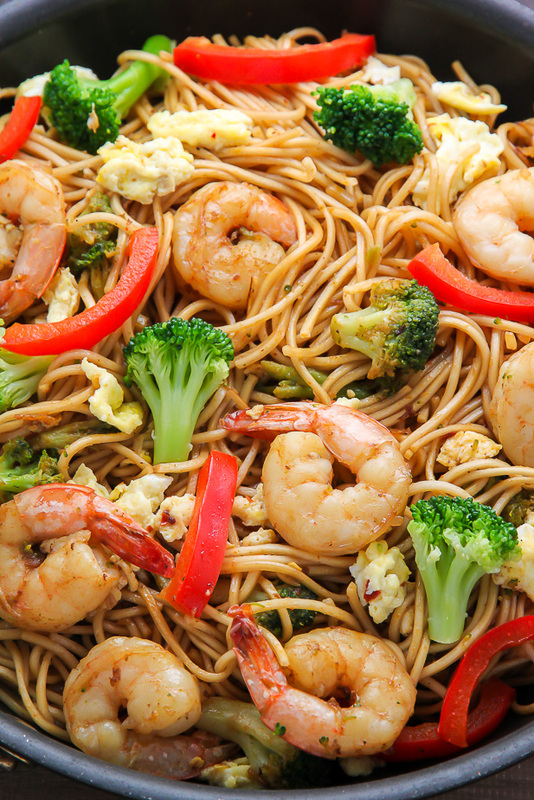 For this recipe you’ll need shrimp (preferably already peeled), broccoli (I used frozen to save time), red bell pepper slices (again, I used frozen here) lo mein noodles (you can find these in the ethnic food aisle at most grocery stores), a pat of butter, crushed red pepper flakes, 2 eggs, sesame oil, soy sauce, lime juice, fresh grated ginger, sriracha sauce, garlic, and just a kiss of brown sugar. The first thing you’ll do is set the water to heat on the stove, then you can prep the sauce and cook the shrimp/veggies as it comes to boil. The lo mein noodles I used only took 4 minutes to boil, so make sure you keep an eye on them once you place them in the pot. 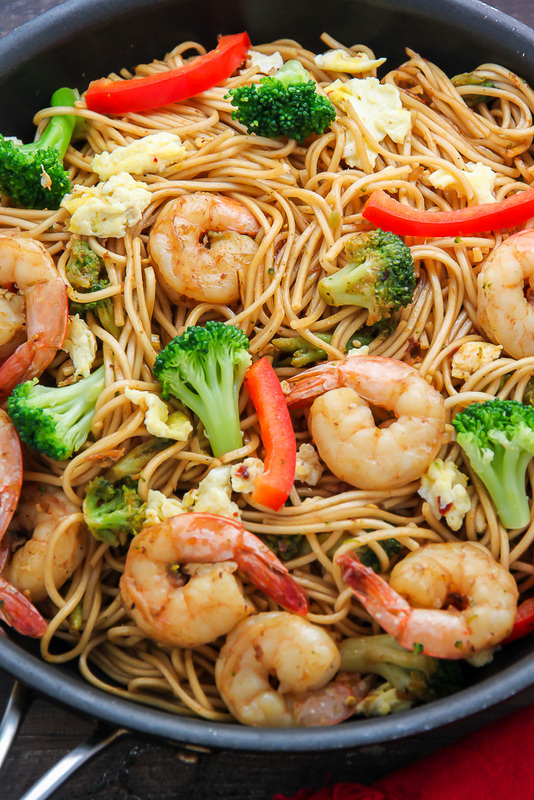 Once the shrimp and broccoli have cooked, and the noodles are boiled and drained, you’re simply going to combine all of the ingredients in one pan, toss in the sauce, and cook for another minute or two. The best part? It tastes even better than Chinese take-out! My friends basically beg me to make this whenever we do dinner at my place. Warning: This dish is quite spicy as-is, so I highly recommend tasting the finished product before adding any additional hot sauce/pepper flakes. Also, if you’re sensitive to salty food, I suggest using low-sodium soy sauce. I have made this recipe using both varieties and each way comes out delicious. The plus to using low-sodium soy is you can always a more if needed. Hope you guys love this recipe as much as we did! If you make it, I’d love to hear your thoughts in the comment box below. 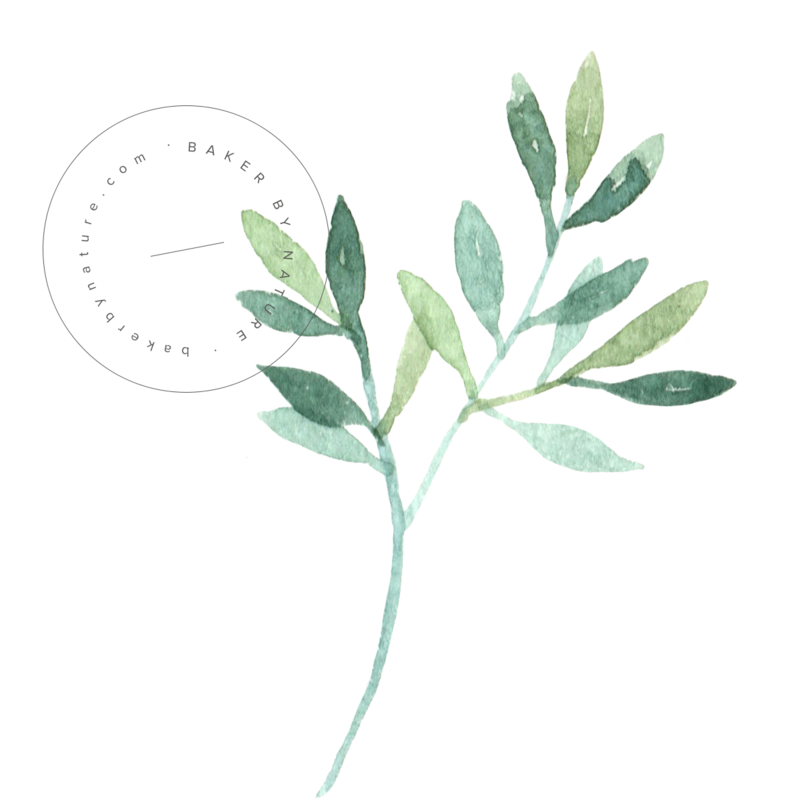 Better yet – snap a photo and share it with me on instagram using the #bakerbynature. 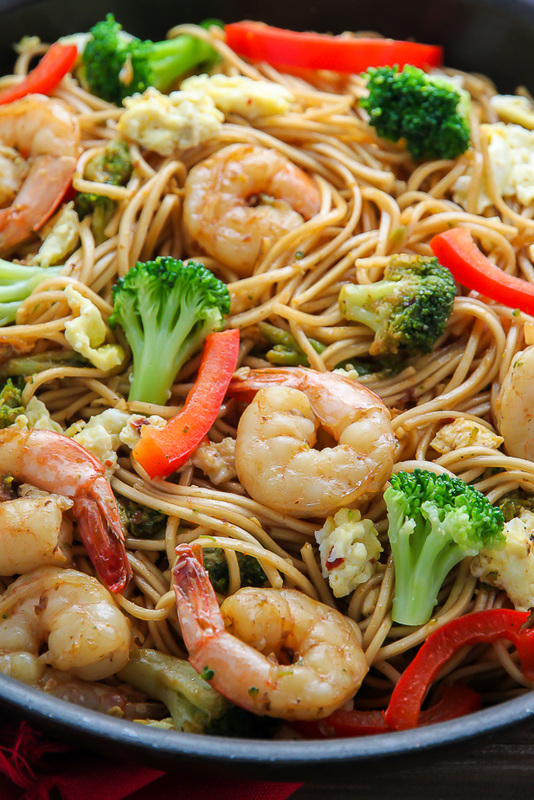 This 20-Minute Shrimp and Broccoli Lo Mein is one of our weeknight favorites. So much better than take-out! Bring a large pot of water to boil. 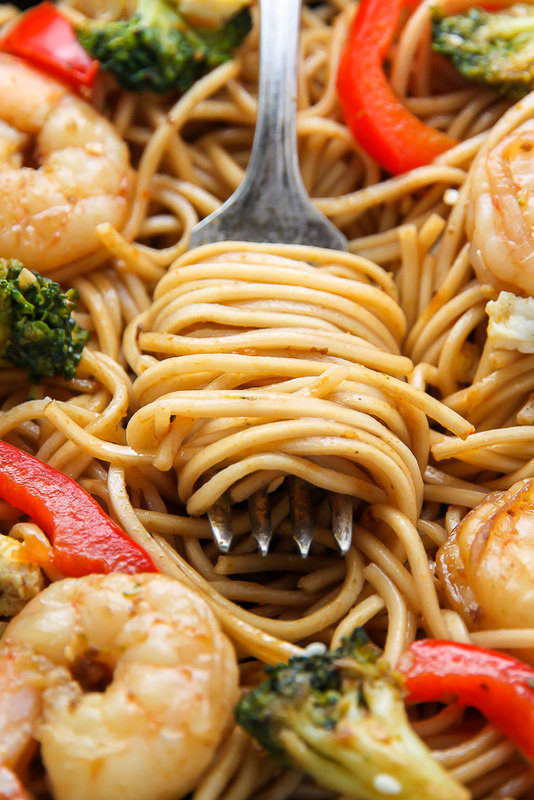 Once the water reaches a rolling boil, add in the lo mein noodles and cook for 3-4 minutes, or according to package instructions. In a small bowl combine the lime juice, brown sugar, soy sauce, sriracha, ginger, and 1 teaspoon of the sesame oil; whisk well to combine. Set aside until needed. Melt the butter in a large non-stick skillet over medium heat. Add in the crushed red pepper flakes, then pour in the beaten eggs. Stir gently and cook for about 3 minutes. Once the egg is done cooking, keep the pan on the burner but transfer eggs to a small plate; set aside. Add 1 tablespoon of the sesame oil to the pan and increase the heat to medium-high. Add in shrimp and cook for 1 to 2 minutes on each side, or just until firm and pink. 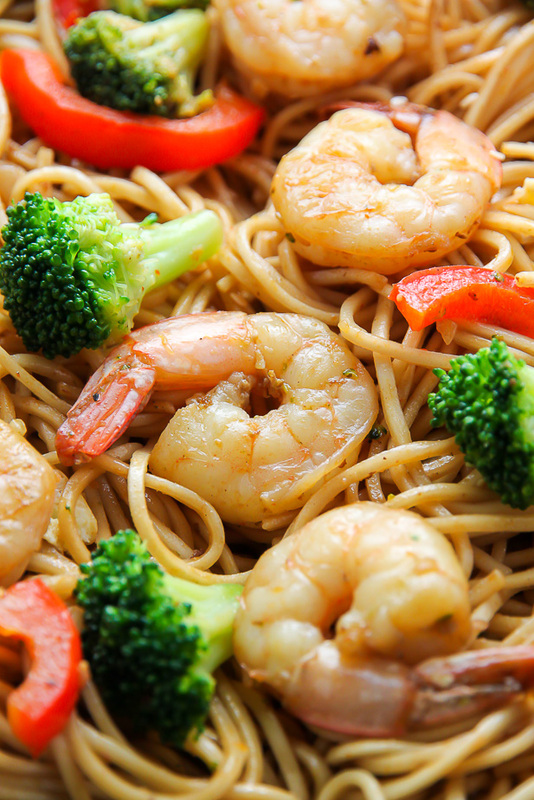 Remove shrimp with a slotted spoon and transfer to a clean plate; set aside. Add the broccoli and red pepper strips to the pan, increase heat to high, and add in the remaining sesame oil; stir fry until just charred; about 3-4 minutes. Stir in garlic and cook for one minute, or until fragrant. Add drained noodles to the skillet along with the cooked egg, shrimp, and prepared sauce. Reduce the heat to medium-low, and stir well, making sure all ingredients are coated with the sauce. Cook for a minute or so, just to ensure all ingredients have been warmed. Serve at once. I added sesame seeds at the very end for a little crunch, if you'd like to do the same. Fast food never looked so incredibly yum! This sound so good right now! When you buy shrimp do you devein them yourself or will the butcher do it for you? I love your pics here and will def. try to make this soon. Hi Iram. I buy my shrimp peeled and deveined already to make prep time super fast 😉 I hope you love this recipe as much as we do! yum! made this tonight wow! but yours and recipe looks/sounds better! bookmarking now! ty! xO! Can I substitute the sesame oil for olive oil? I believe it would affect the taste because sesame oil has a distinct flavor. But I don’t think it would affect it adversely. I did have to substitute the sriracha with Thai chili garlic sauce (because that is what I had in the fridge) and it was very hot/spicy, but still, all in all, it was delicious. YUM! This was absolutely delicious! I added onion (it was with the frozen bell peppers), sauteed mushrooms, and some cabbage I shredded, and it was DELIGHTFUL. It was easy, and my husband loved it. Thank you! This looks absolutely divine bakerbynature, fabulous pictures and I can’t wait to get stuck in! I’m planning on cooking it up tomorrow as my daughter is coming over for lunch. I just wondered if there is an alternative to Sriracha hot sauce (not familiar with it over here in the U.K. or it may be known by a different name)? Thank you! Hi Jenny. I think any thick Vietnamese hot sauce could work 🙂 I hope you and your daughter enjoy it! I think spaghetti or linguine would be fine. The meal was great! I didn’t use the hot sauce. Ginger. I will make it more often. This sounds so yummy, I’m excited to make it tomorrow! I have peeled, de-veined, cooked, frozen shrimp. This will be my 1st time cooking with shrimp so I don’t really know what I’m doing in regards to it. Do I thaw it before “cooking” it again? Thanks! This dish was absolutely delicious and definitely had a kick to it….I knew it would so I only measured out half of the sriracha and crushed red pepper flakes. I Will make again! I wish I had leftovers. I’m trying this for the first time, it looks like something I can get use to. Made this for lunch today, for myself. I divided everything by 4. Used Sweet Thai Chilli sauce instead of Sirracha (its what I had on hand), and used already cooked shrimp (stirred them in last). It was super yummy! Will definitely make again! My hubby n I love this recipe! Super fast n easy!! I used Hokkien noodles. They were great and no need to boil water and have another pot. I also added mushrooms. It turned out great. Spicy for sure. I might cut back on the hot stuff just a bit next time, but it worked for me. SO spicy! But SO good! I might half the sriracha next time. 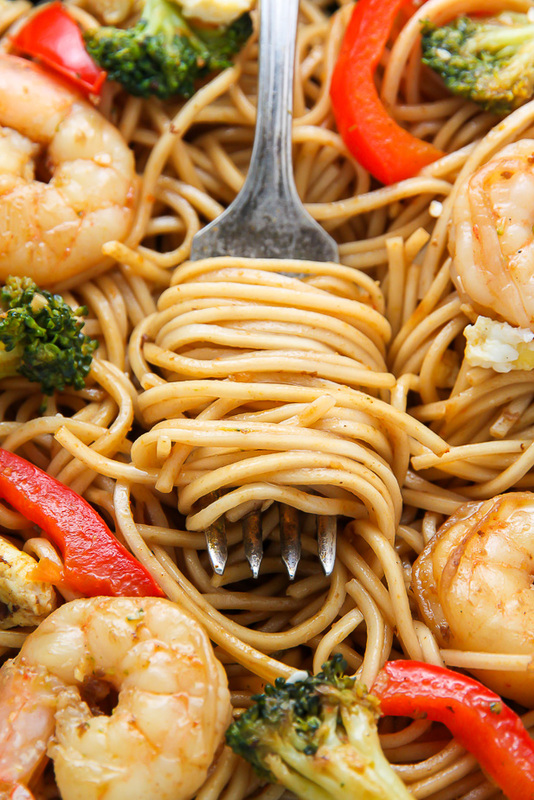 I ended up using a 12 oz pack of lo mein noodles, so I get leftovers – lucky me! 🙂 Thanks for the recipe! Made this tonight minus the sriracha sauce (not a fan of spicy stuff), used fresh veggies, and threw in some leftover steamed green beans in the mix….couldn’t stop.eating it! Maybe not a good thing?? Will definitely be making this again and again!